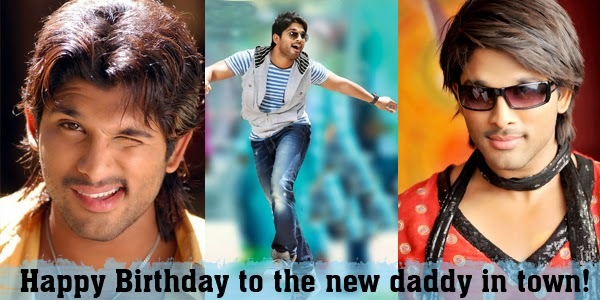 Raaga.com: Happy Birthday to the new daddy in town! One of the biggest stars of Tollywood who was blessed with a baby boy just two days ago, Allu Arjun celebrates his birthday today. Allu Arjun entered into the industry a little more than a decade back and ofcourse he did not need even a 3 years to make it big in the industry. His first hit was Arya which released in 2004 directed by Sukumar. With Devi Sri Prasad composing scores for this song, one cannot not expect a hit! Ofcourse, one can say the history was rewritten and records broken where Arya 2 was released by the same director.Well we are ofcourse not forgetting the track ‘Ringa Ringa’ which made a whooping success all over the country. Be it any sangeet, to college functions to anything close to fun, this song is the firs choice anyone wants to shake a leg to. Such is the impact the powerful beats of this song creates. With atleast a 20 films to his credit, Allu Arjun is ofcourse the heart throb for all girls following the Telugu Film Industry closely. The movie Julayi was where he acted with the slim and trim Ileana, also famously known as the ‘Idipu Azhagi’ in the Kollywood Town. Another hit was ofcourse Vedam where he was seen sharing the screen with Anushka. His role in the movie Badrinath that released in 2011 starring Tamanaah as the female lead received a lot of constructive criticism as well. AlluArjun has been lauded by many for his powerful acting and commendable role enacting techniques and is ofcourse a favourite for many directors.With Race Gurram set to releasing this April, Allu Arjun has more hopes and more happiness coming his way this birthday. Raaga.com wishes the star a very happy birthday.